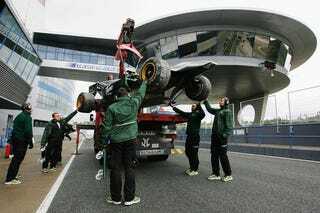 The bloom is officially off the new Lotus F1 effort — ex-McLaren F1 driver Heikki Kovalainen smacked his green and yellow T127 into a tire wall at Jerez during testing today. Lots Of Trouble, Usually... Scandanavian? With the paintjob of its glory days in the ‘60s, a team with the name Lotus is back in Formula One. In the aftermath of Kovalainen's crash, engineers hustled to shield the car's exposed bits from prying eyes — drapes were thrown over the T127's nose and sides, and fabric barricades were brought in to close off the garage. The whole mess brings to mind a number of Chapman car-falling-apart jokes, most of which have spent the past sixteen years in a kind of light-makes-right slumber in our brains. Because we are sporting and fair individuals, we will resist the urge to crack wise. For now. Note: The bald guy in the picture immediately below is Mike Gascoyne, Lotus's chief technical officer. Poll: Who wants to start a pub brawl with that bloke? He looks like a badass.